Recently, a question came up on the KDE Community Forums regarding the use of multiple Google Calendars with KOrganizer. The preferred access up to now has been with googledata Akonadi resource, however that doesn’t support more than one calendar, and (at least from my unscientific observation) seems to be rather unmaintained these days. Luckily, not all’s lost. Akonadi recently gained the opportunity of accessing CalDAV resources, and Google Calendar also offers a CalDAV interface, hence this is possible. This post will briefly describe how (thanks go to PIMster krop, which casually mentioned the possibility on IRC and prompted me to investigate). Notice: I am running trunk (4.7) so I have no idea if the steps posted below are possible in 4.6. Also, this worked for me with my particular setup. YMMV. 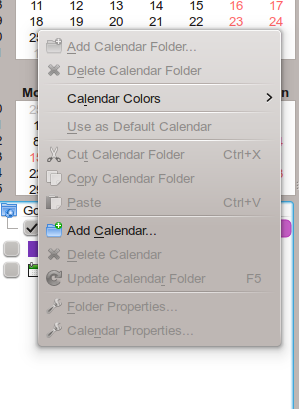 First of all, you need to obtain the calendar IDs you want to use. This is done in the web version of Google Organizer, in the settings page of your specific calendar, near the private links: it’s a string of alphanumeric characters followed by @gmail.com. Copy it in full (even the address part) as you will need it later, and do it for every calendar you want to use. In the next screen we’ll have to add what’s needed for our calendar to work. 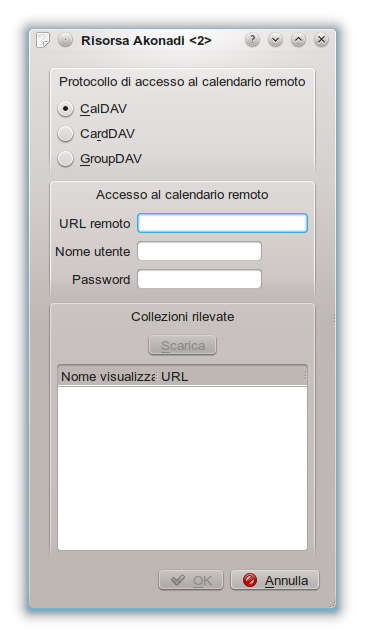 In Remote URL put https://www.google.com/calendar/dav/YOURCALENDARID/events (https,** not** http) then put (again) your Google account credentials in the relevant places. Then click on “Download” (Scarica here) and you will see (after a while) your Calendar being loaded in the “Found collections” pane, with the name you set in Google Calendar. Click OK to save the configuration. This will bring you back to the previous window. For more calendars, repeat the steps (click on Add, insert URL, Download, OK) for all the calendars you have to display. That’s it. If you encounter trouble, have a look at ~/.xsession-errors to see whether Akonadi managed to connect and download your existing items correctly. And don’t forget to file bugs!